If you’re looking for a prestigious yet comfortable venue in the Silicon Valley, Silver Creek Valley Country Club is it! 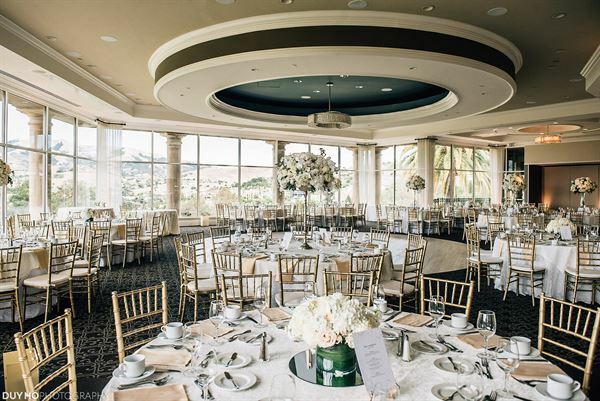 Imagine walking into our grand ballroom and looking at an unmatched panoramic view of the rolling hills of San Jose. The floor-to-ceiling windows provide a stunning backdrop for your special event, wedding or meeting. Silver Creek Valley Country Club helps make your business meeting, anniversary, family reunion, wedding ceremony and/or reception the very best.In addition to smaller business meeting rooms, our elegant Main Dining Room, with beautiful valley views, accommodates up to 250 guests. For entertaining smaller groups, try the intimate Chaboya Lounge with a paneled bar, fireplace, and adjacent outdoor patio providing a spectacular waterfall view. Wi-Fi access is available for your use. The Main Clubhouse looks like an Italian Villa but is as warm and comfortable as the home of a friend. Whether entertaining clients or gathering with family and friends, members enjoy exceptional service and superb dining with the attention to detail they expect and deserve.